Prevention makes sense. To prevent disease, we vaccinate. To prevent traffic deaths, we install seat belts. While we recognize intuitively that preventing homelessness is a good idea, there has been little movement in Canada to make that happen on a national scale. 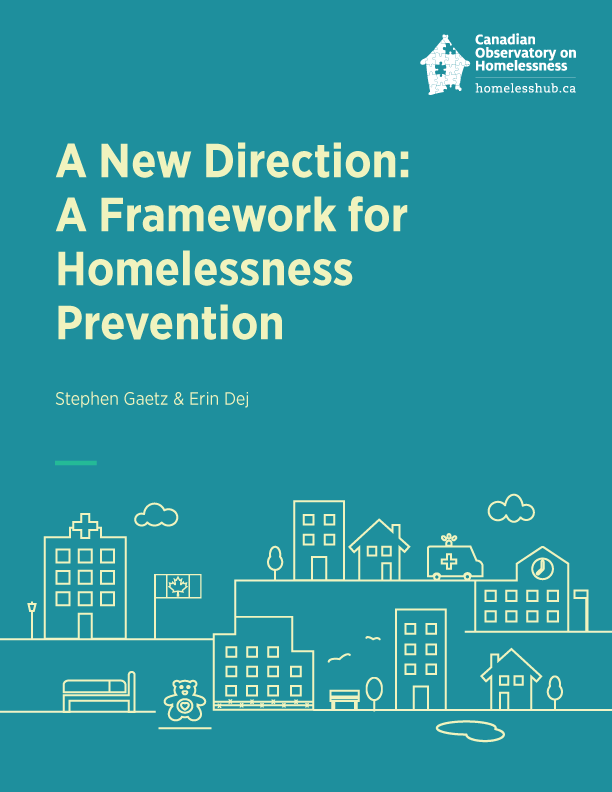 A New Direction: A Framework for Homelessness Prevention sets out to provide the language and clarity to begin that conversation. Since mass homelessness emerged in the mid-1980s, we have largely used emergency services to respond to people’s immediate needs. While we will always need emergency services to help those in crisis, over time these short-term responses have become the standard method for managing homelessness long-term. In the last decade, Canadian policies and practices have begun to shift from managing homelessness to finding solutions, in particular the expansion of the Housing First approach across the country. The Housing First model provides housing and supports for people experiencing chronic homelessness with no housing readiness requirements. New research, innovation, and best practices have propelled our thinking to make the goal of ending homelessness realistic; however, we are still missing an important piece – preventing homelessness in the first place. Why must we wait until people are entrenched in homelessness before offering help? In A New Direction: A Framework for Homelessness Prevention, we set out to uncover what it will take to stop homelessness before it starts, to avoid its often-traumatizing effects. The aim of the framework is to begin a nation-wide conversation on what prevention looks like, and what it will take to shift toward homelessness prevention. Using international examples, the framework operationalizes the policies and practices necessary to successfully prevent homelessness and highlights who is responsible. Above all, it situates prevention within a human rights approach. Now is the time to prioritize homelessness prevention.